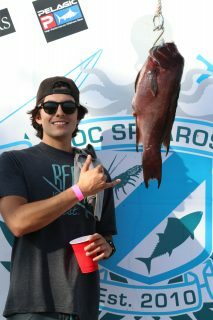 The OC Spearos would like to thank all the competitors and spectators who came out to support the 2017 OC Classic Spearfishing Tournament & Raffle. 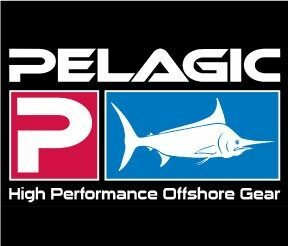 We’d also like to thank our Amazing sponsors, especially Petros & Spear America for always supporting the Spearfishing community. 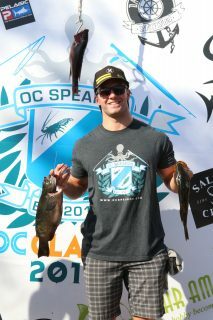 The OC Classic was the largest Spearfishing Tournament in Southern California history with 121 spearos competing to become Tournament Champion and over 300 hundred people in attendance for the weigh-in and raffle. Congratulations to our top 5 competitors for succeeding in such a huge field of competitors & varying conditions! 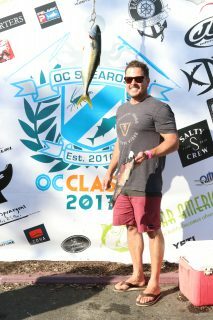 The 2017 OC Classic was our most successful tournament ever. 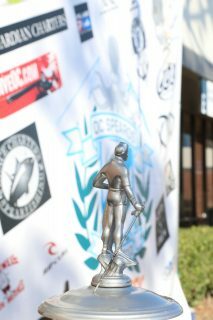 We had a tremendous amount of support from our sponsors and had a huge showing in the number of competitors that entered the event. 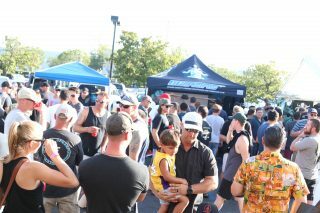 While other tournaments this year have had a relatively small showing the success of our event is telling me we are doing something right down here in Orange County Ca. It’s been a real pleasure to be the president of this fine club and I get a sense of satisfaction from the success, especially after the huge effort our board members made to make this event stand out. I am very proud of the team we have assembled and they have shown that they can do big things with very limited resources. 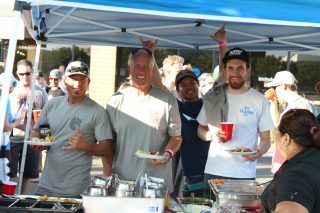 Over the past years I have seen the OC Spearos begin to transform from a motley crew of spearing buddies scratching a clawing to get sponsors to the largest spearfishing club on the west coast. 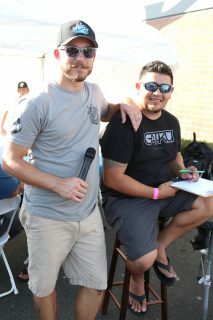 We plan to continue our efforts to provide a platform where our local divers can continue to grow in this sport. Long live the OC Spearos! Tough hunting was an understatement. 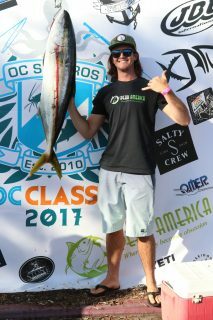 Current reports on the offshore scene were bleak, SCI and Catalina hadn’t been producing properly, and coastal reports of fish and visibility were poor. 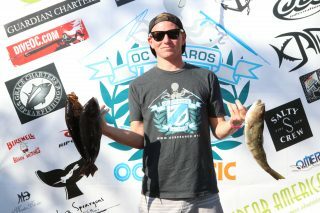 I made the decision to head towards the Coronado Islands where I was fairly confident I could take down a solid 3 fish stringer. With a 3:30am wakeup, I packed up my truck and made the trek from Laguna Beach down to San Diego, hopefully being on the water around first light. I was able to have my buddy Max caddy me around all day on his 39’ contender as we quickly ran down to the zone. Arriving at my first spot, water temp around 70F, visibility was in the 100 foot range, however current was non-existent. With lack of current I immediately knew it would be challenging to find the yellowtail, bonita, or bluefin which had been prevalent in this area the previous few weeks upon which I had placed my strategy. I began making drops in the 70-80 foot range and aspetto diving on the bottom with the hopes of a lone home guard yellowtail or perhaps a nice 20lb+ sheepshead would come in. After around an hour at this spot with zero sightings of any contending fish I began scrambling around the islands, hitting many of the spots I was confident would be holding. Most of the diving throughout the day was on the deeper high spots where yellowtail and large sheepshead liked to hang out. 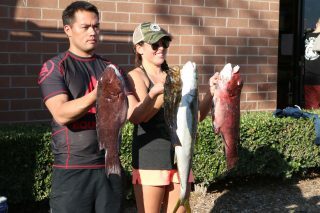 A couple of reefs had bait stacked up nicely however it was an absolute ghost town in regards to gamefish. Jumping from spot to spot, covering all sides of the islands, time was winding down. I made the decision to leave the islands and head inshore for a potential goat or halibut. The first inshore spot was in the 45-50 foot range in an area which had been loaded with kelp in previous years. Knowing the kelp was gone, I hoped to maybe encounter a white sea bass or halibut laying on the cobblestone bottom. 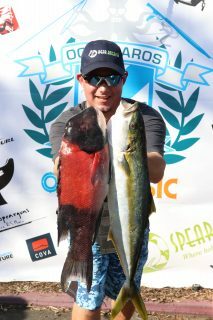 Water was a chilly 63 on top and 57 on the bottom with visibility in the 8-10 foot range. Making drops in a zone like this without any relief structure on the bottom is challenging. After a few dives freezing in my 5/3 wetsuit and not seeing any action, it was time to move out once again. I headed north to an area which I knew would have a small bit of kelp, albeit nothing like previous years. Water was dirty here. Metering around, I found a nice bit of structure and began making drops around it in the hopes of finding a big goat. On my first drop I was schooled by dozens of opal-eye and watched as a single triggerfish, it’s silhouette obvious amongst the herd, shot towards the rocks and darted into a cave. I pursued it into the rocks and quickly placed a shaft into him, finally securing my first fish after many hours of diving. At least I now had some ceviche meat to look forward to. Soon after, I took one of the larger opal-eye on this reef. I continued to cover the surrounding area in hopes a decent goat would appear. After an hour or two on this structure I had yet to see anything which could compliment my other fish and decided to move off and cover more ground in the dwindling time left. I made a couple drops in some nearby kelp stringers yet visibility was poor, current was running the wrong direction, and lack of baitfish gave me the feeling it was not worth it to be there. This plan to head to San Diego was increasingly looking like a bad call. With about 30 minutes of dive time left and no big goats seen, my only option was to set up near the same structure I had dove earlier yet this time in the 65-70 foot range. Maybe there would be a nice lingcod or goat hiding out there. On my first drop, I was amazed at the amount of calico bass covering the bottom. 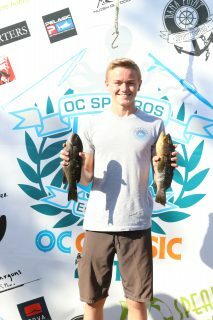 Schools of opal-eye were flowing through, and a couple more triggerfish were making their way around. Baitfish were visible from the surface with a slight current running through. Noticing a larger silhouette, a large 8-10lb calico bass made a quick appearance and vanished into the gloom just as fast as it had appeared. That was the largest fish I had seen all day. Now with precious minutes remaining, I surfaced to get a good breath hold before making a last drop or two. Breathing up, something caught my eye about 15 feet away in the gloom. A single yellowtail had appeared out of nowhere and swam by under me at the edge of vis. I made a fast, silent drop, extended my gun, and squeezed the trigger. In the split second between that shaft launching out, time slowed down as the pressure of needing at least one solid fish to weigh-in, crept in on me. This was my only chance. A split-second seeming like an eternity came to an end, as line began screaming off my pathos 110cm carbon. Unsure of my shot placement, and without the added security of a slip-tip, I played the fish gently as it ran like a champion. I knew this was no rat. After bringing the fish to color 3 times yet having it scream down towards the bottom, I called for a second gun to be thrown to me. Normally a second shot on a yellowtail would be un-necessary, but in a competition you have to do anything to secure your catch. Gently playing the fish with one hand, I loaded the gun, desperately attempting to keep just the right amount of pressure to keep the flopper open without the fish tearing out. After loading the gun, I slowly played it up to color, dove down, and placed a great holding shot with my 130cm. Once that second shot was in, I knew the fish was mine. 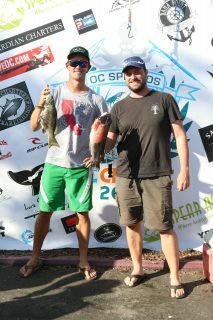 With 3 fish in the bag, we sped in to port, relieved to have at least one decent fish to weigh in and not feel a complete kook after going through so much effort all day. 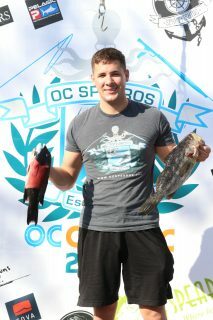 My original ideal scenario for the day was to have a 20lb+ yellowtail, 20+lb sheephead, and 10lb+ bonita yet I had only one of those fish to submit. 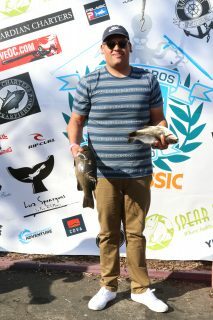 In such a large tournament with so many competitors covering so many locations, someone could have easily lucked into two, 20lb+ fish, or a 20lb fish and 10lb fish and leave me in the dust. At this point it was anyone’s game as far as I knew. Hauling it back up to Spear America much faster than I usually drive, I had to make sure I made that deadline if by some miracle I had a chance at-least hitting the podium with one solid fish. Arriving back at the weigh-in with 25 minutes to spare, the pressure would really begin to set in as I watched other competitors weigh in. 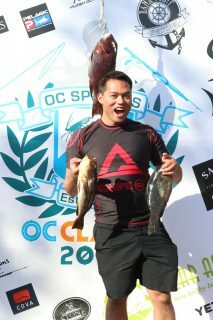 One by one competitors weighed their catch yet it was looking like I still had a chance at winning. Concern now turned to Paul Romanowski. Having competed against Paul countless times for over a decade, I knew his style was to wait until the last minutes to weigh-in. 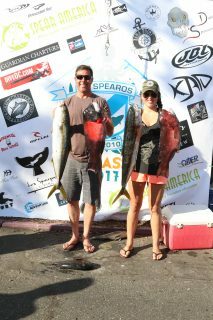 As the final competitors weighed in, Paul and Lauren opened their fish bag to present a solid yellowtail and sheepshead each. I now realized this was going to be a very close call. 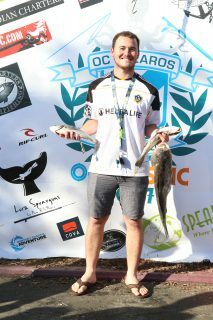 A triggerfish and opal-eye were far from what I had planned as a 2nd and 3rd fish, could they somehow be enough to win? After all three of us weighed our fish, yet not seeing any numbers placed on a scoreboard, my only temporary relief from the tension would come in the form of those kegs of Stone IPA. 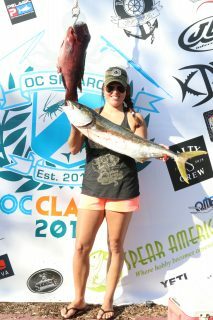 As the crowd was rallied to announce the final decision, Paul and Lauren were announced as having tied for second place, and all the hard work and miles covered had payed off as my catch was announced to have secured first place. With over 200 miles covered, diving over a dozen locations in two different countries, hitting everything from 20-80+ feet. This was certainly one of the tougher days competing I’ve have had in a while. 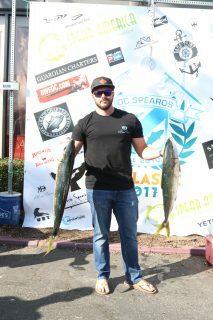 Would love to give a huge thank you to my sponsors Spear America and Sea Sniper for all the gear to get it done, and most importantly the OC Spearos for hosting such a fantastic event and without whom none of this would be possible. If there is anything I have learned from competing is that you can never give up when things don’t go your way. Have a strategy, as well as backup strategies when things don’t go to plan. One must be prepared to go the extra miles sometimes and do what it takes to secure a spot on the podium. When it doesn’t go to plan (as so frequently happens) at least you know you have tried your hardest and done everything in your power to perform on comp day. Launched the boat out of Huntington early in the morning and headed to the oil rigs outside of San Pedro. Suited up, got in the water, and my first dive down a pair of yellowtail swam by at about 30 feet. I lured one close enough, with the open-close hand motion, and took a shot with 120 Pathos carbon and slip tip. With the current blowing toward the rig, the yellow wrapped once around a horizontal pilon despite my efforts to keep it off. Sea lions were immediately bombing on the fish. I quickly called my buddy William over to watch my back, took a breath and punched back down. I was able to free the yellow and keep it from wrapping again, sea lions trying to steal it all the way to the surface, and back to the boat. A after some time, and trying to avoid sea dog company, I spotted a large female Sheephead. Stoned her, so there was no issue with wrapping up in the rig again, and got the fish to the boat quickly. 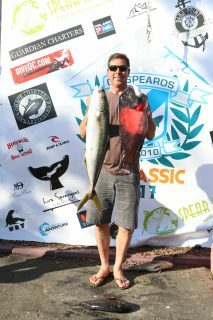 Later we moved to a local reef and I took a decent size opal eye that I though would tack a couple extra points to my score as my third fish, and headed to the weigh in at Spear America. Made it with about 10 minutes to spare. I weighed in my fish and after a few beers, and mingling with club members, I had completely forgotten my catch/score nor did I expect anything. Hearing my name being called to come stand on the 2nd place podium was probably the best surprise of my life. I’m still floating on cloud 9 from the stoke! 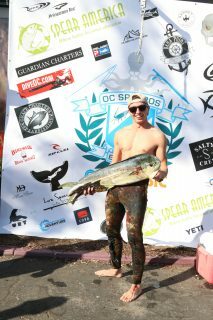 A huge thanks to Spear America, Oc Spearo’s, and all who competed! After teaming with Lauren for the US Nationals, Lauren and I have really been having a good season training and diving together, and we wanted to take the momentum and carry it to the OC Classic. We dove different boats the week prior for the Scrambles Meet, and it told me a lot about what my strategy should be for the upcoming event. We had a little more time to work with, and this weighed heavy on my mind- where to go? Lauren secured a boat for us, and the thought was to div SCI early, and look for paddies on the way back. But word on the docks was the paddies dried up, and SCI had fish but they were being stingy. After discussing a bit more about the speed and size of the boat, I realized that we had 4 divers, not 2, and the boat would be stressing to carry that load for a long distance run; and if we had rough water, it would be slow going. We decided to tow the boat from Dana to HB harbor, and maximize time available. First stop, we knew this was our better shot at pelagics. There were some YT around, and we stood a good chance to get into them without burning the clock. Aaaannnd, She’s ON! Lauren had her first yellowtail ever, and I was really happy this was how the day started. I saw a couple, and quickly backed her fish up with one. Will and Jose did not cross paths with them, so they worked on some reef fish, as Lauren and I went about working to secure a second fish before we ran off. Last stop was the long rockpile….. saw a giant goat who knew me pretty well, and he kept his distance. 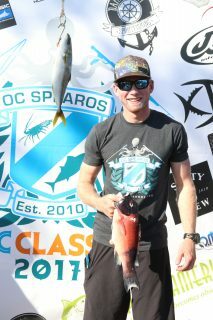 I connected a couple other fish, but I knew- while it wasn’t enough to knock it out of the park, the strategy had played well, Lauren and I dove very well and did not miss when it counted, and I knew we were in contention. We had a comfortable amount of time, so our planning was good all the way around. I about died when I heard Fernando say “Lauren, Paul; I don’t know how to say this, but you have a tie.” WOW! I guess teamwork really DOES pay off! By virtue of her T being larger, Lauren took 2nd place, and I was 3rd. A great finish for us, I was really happy with the dive, and of course, Austin getting some redemption for being nixed by only a couple points in the Scrambles meet the week prior- he was out for some redemption. 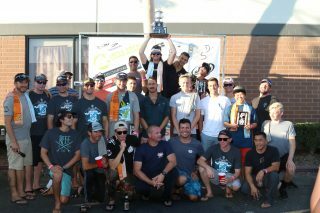 And the entire event, the party, the food, the prizes, what a great day! 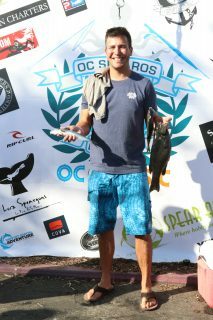 Thank you to the OC Spearos for having us, it was a great time!